1. Update 0.8.x Fortification, defensive traps and zombies climbing through windows. 2. Update 0.9.x Game loop and balance. Shooting tents no longer produces the wood particle effects. Updated footstep sounds on alternative concrete surfaces. Fixed errors being caused by the fuel cap at fuel stations. Fixed isue with harvested items which prevented them from being harvested. Fixed scenario where the player wouldn't always be marked as in game. This was causing multiple small things to break. Harvesting from tents now gives cloth. Searching for items now fixed. Previously it was possible to search an object and find nothing and then be able to search again to immediately find items. Once a search point is depleted it will not give items again for X amount of time. Fixed issue with audio where it wouldn't always be correctly muted when it was meant to be while in the menus. Rivers can now be searched and give water. Added sliding damage when sliding down steep cliffs. Added sliding when standing on steep cliffs. Stopped the player being able to stand on thin fences. Players now slide off. Holding interaction on door handles now opens the door as well as the normal press to open functionality. Added Iron sight attachement for arg15. Added reflex sight attachement for arg15. Added compact 2x scope for arg15. Added Apug 4x scope for arg15. Added small oil filter suppressor for arg15. Radios in backpack now receive transmitions. Dead players can now be looted. Weapons are dropped into the world and the backpack becomes a mobile container. Pieces cut from trees now appear instantly! Logs cut from trees can no longer be moved using placement mode due to an issue with their pivots that prevents them functioning as expected. Fixed issues with felled trees where the player could bump into the chop sections. Added core functionality for weapons to have attached objects. Added functionality for pickups to have visual attached objects. Stags and chickens can now be harvested for items. Base introduction of Stag and chicken AI. Chickens now die with ragdoll. Passive AI now flee from noises created by bullets flying past them. it's now possible to switch seats while inside a vehicle. Fixed issue which could sometimes mean drivers/passengers would be invisible inside a vehicle. Vehicles now have resistance when driving on water. Vehicles can no longer drive on water. Added functionality for the player to slide off vehicles when they start moving. Added functionality for player to receive damage from moving vehicles. Added funtionality for damaging AI when being hit by a vehicle. Can now enter vehicles pressing interact. Assigned animations for crawling zombies attacking. Fixed various fps animations that included an empty cartridge/shell that could be seen when slamming doors open. Holding down attack button now continues to swing weapon. Ejected shells/cartriges now play sound when they hit the ground. These are specific per weapon and to the surface the player is stood on. Decreased and fixed the intensity of the muzzle flash distortion. Updated and improved all weapon muzzle flashes. Bullets now whistle as they pass overhead. Removed cpu overhead that was being caused by zombie checks for traversing objects. Axe and hatchet now do more damage to trees. Axe and hatchet now receive less damage when being used on trees. Current day UI gets cleaned up when forced disconnect happens. Added the remainder of the GUI for the guide. Item hovers now start fading as soon as an item is picked up. Highlights for cut point on trees that have been cut down are shown from further away so that they are easier to find. Added highlight to selected item in the inventory to make it clearer what you have selected. Added functionality for highlighting possible attachments. Added functionality for viewing and removing attachments in the inventory. Improved description area layout in the inventory. Fixed inventory descriptions getting cut off. Fixed issue which allowed the player to navigate past the last page of the guide. Progress circle UI when interacting no longer plays if the item doesn't have the action being requested. Item hovers are now slightly brighter. Item hovers fade closer at night to simulate limited vision. Zombies no longer run through large trashpiles. Fixed floating platforms around mount baron. Road texture in Fishing town improved. Church no longer disapears when it should still be visible at distance. Fixed issue with campzone smoke disapearing and not being loaded again until the area was fully unloaded. Fixed gab in floor between doorway in Old House variants. Added environment filler content on terrains 28, 2 and 10. Added environment filler content on terrains 42 and 47. Added environment filler content on terrains 35, 36, 43, 44, 12 and 4. Fixed missing interiors in house variant 3 and 2. Fixed garage lights that were clipping. Popovs roof access now has a door and frame. Added environment filler content on terrains 62 and 54. Added environment filler content on terrains 14, 22, 37 and 29. Added environment filler content on terrains 08, 15, 16, 31 and 32. Added new POI/Campsites guide locations around fishing town. Added new POI/Campsites guide locations around Sage Creek. Added 2 new POI/Campsites guide locations around Addersfield. Added 2 new POI/Campsites guide locations around old town. Water tower no longer pops in from so close. Zombies now attack player that are inside of a vehicle. Improved overall player noise mechanic so that it's more reliable when triggering zombies. Tweaked the idle sounds to make them less confusing against the new annoyance mechanic. Reduced the overal distance than zombies are drawn to the player from. This is intended to stop them aimlessly breaking out of buildings unless they have a chance of reaching the player. Reduced the overal wander range and frequency for day zombies. Added zombie annoyance functionality which allow the player to sneak and receive feedback from zombies. They grunt and become agitated as they hear you moving around. Zombies can now be looted for items. They have a chance of giving a small amount of ammo, rags, nails etc. 6 new attack animations added. Fixed issue where the zombie would throw errors into the log when inactive. Zombie attack speed tweaked to make the zombies feel more aggresive. Added base set of animations for Cricket vehicle. Proxy and player driving animations added. Added all new melee animations for 3rd party characters. Updated all broken cabin prefabs so that their doorsways are accessible to zombies. Added water storage container drop. Removed the resource requirement from antibiotics in all treated crafting recipes. Removed resource on antibiotics, bleach, washing liquid and wire spool. Added mobile water storage container. Added all new a2z Cricket vehicle. added 4 rural car park variants. Added 2 rest stop area variants. Added 3 variants of shipping containers that have smashed open. Added 4 new industrial compound variants. Added 16 new graffiti objects. Predominant use is for guiding the player to useful objects. Added 3 variants of shipping container bunkers. Added 2 variants of popup refugee camps. Added 2 variants of rest stops. Added new video permission used for new video tools. Added /Dronecam command which allows player to fly around with smoothed out movement. Added /Videomode command which disables unnecessary UI for recording. Added /Resest achievements command to reset stats and achievements. Added /PauseStreaming command which allows player to stop any sector loading. Added /Daylength command which allows player to set the day cycle length in seconds. Added parameter to /spawn command to allow player to spawn zombies in a circle around them. Resolved issue with bridge near old town which prevented players standing up from crouched while stood on it. Default fortifications sounds are now affected by the audio sliders. Felled trees should no longer disapear after cutting the first piece off. Overall improvements to the consistency of the felled trees to prevent instances where their position did not align on the server. Fixed issue with crafting where it would only take 1 of the required consumed objects. Fixed issue which would prevent the world initialising for some players on first join. Item pickup time reduced to make it feel more fluid. All crafting recipes times reduced proportionality. Removed lag being caused by incorrect physics on the server relating to zombies. Fixed issue with item relevance which would throw null refs on the server. Fixed issue which would stop guns being able to be reloaded. It's now possible to smash off locks that aren't locked. Attacks can now be performed with melee weapons with left click even when they don't have an alternative attack. It triggers the normal left click attack. Improved melee hitting accuracy on fortification objects. Overall loot percentage and spread balance. This is our first attempt at balancing the loot percentages. Sealed food cans can now be cooked to get them open. Melee weapons now break through use. Fixed scenario where sounds would incorrectly start playing even when sliders were turned down. This happened when returning to the menu. Now possible to harvest water directly into new camping canteen. Blood splatter now works again when shooring through zombies! Added scrap metal points to metal junk piles, scrap truck and motorbike. Melee weapons now take damage and destroy when using them against zombies. Created new camping canteen pickup and relevant consumables (Works like water bottle). It is now possible for items to burnt away on a cooking surface. Picking up item tweaks to make sure the grab animation always plays. Tents now function as item harvest points. Window frames now include frame interior and 4 individually breakable glass pieces. Frame interiors respawn on server restart to prevent stagnation. Added working Guide page to the inventory which helps new players learn the basics of survival. Added base set of achievements for tutorial. Clean rag recipe now returns clean rags instead of dirty. Axe head from scrap metal. Hatchet head from scrap metal. Hammer head from scrap metal. Clean pot from scrap metal. Bear trap from scrap metal. Added new player vitals UI that displays appropriate player information when needed. Can also be called up all at once using the inspect functionality. Ammo now displayed in new UI. Removed some notifications that are now handled by new UI. Introduced base steam stats and achievements system. Fix for scenario where zombies could be spawned floating in the air. Potential fix for scenario where zombies could float away as though they have zero gravity. Zombies now climb through windows faster. Zombies no longer exit out of windows unless they can directly see the player during the day. Zombies should no longer run to the floor above when they cannot reach the player. Zombies should no longer run outside of a building when they cannot reach the player. Zombies now have improved path finding and should be able to reach the player easier. Zombies during the day are now spread more accurately between buildings allowing for greater amounts. Zombies now sync their movement quicker with less interpolation when they're closer to the player. This causes them to be position more accurately. Zombies now react more agressively to noise. Fixed several scenarios where zombies would behave strangely with doors. Zombies should no longer get stuck inside of doors frames. Current day now displays on the screen while in the inventory. Hotkeys in the inv now show the correct hotkey index in the inventory. Individual hotkey position has memory so that the player can select their favourite weapon of each type and quickly select between them. Scrolling with the mouse scrolls through and entire weapon group and moves to the next. Reduced the switching time slightly. Locks now display condition in their hover UI. Sleeping bag [Use] button in the inventory now says [Sleep]. Added new UI to main menu which shows players own total stats and personal bests. Tab list ping now shows correctly. Tab list now displays each players nights survived. Ammo hints now downgraded to small notification in top left. Small notifications no longer stack together. Hints now play ping sound again when you get the same hint and also play a small animation. Improved grammar and capitalisation on various hints. Some hints have been made unlimited. Some hints have been changed to a limited amount of plays. Added door opening and slamming camera animations. Axe - Improved melee animation. Base Ball Bat - Improved melee animation. Hammer - Improved melee animation. Hatchet - Improved melee animation. WoodenClub - Improved melee animation. Combat Knife - Improved melee animation. Wind up Flashlight - Improved melee animation. Flashlights - Improved melee animation. Machete - Improved melee animation. Opening/closing doors now player a character animation. Added fps interact slam open animation for the player. Slamming open/closed now plays character animation. Fixed Lola and Garry handgun animations that clipped the camera. Jerry can now has base weight. Fixed cleaning kit drop. No longer looks like firewood. Removed tent as a drop. It's now a design prop. Added all bullet impact particles and decals to the preload scene. Item spawning and checking optimisations. Removed exit particle on the blood impact particle. Added the dynamic blood decals to the preload scene. Ai no longer walks through glass store counter. Redesigned police and fire stations. Redesigned stripmalls 3, 4 and 5. Redesigned stripmalls 1 and 2. Redesigned Gas stations 5 and 6. Redesigned Gas stations 3 and 4. Fixed odd tiling on interior gas station wall. Redesigned cabin variants 1 and 2 interiors. Redesigned Cabins 3 and 4 interiors. Redesigned Cabins 5 and 6 interiors. Added base set of attachments for ARG15. Stripmall buildings now have security glass windows. Updated camping grill tripod so that the cooking surface is larger. Added a2z Cricket concept/testing car. Added Scrap metal pickup prop. Audio sliders fixes so that all sounds can be controlled. Server lag improvements to stop players getting sprung back during play. Disabled Container spawned loot in favour of all physical loot. Fixed issue where other players would snap to different rotations when they were idling. Fixed scenario where the player could get stuck in 'Loading' state when connecting to another server while already in one. First join UI no longer plays while still loading into game. Melee headshot damage multiplier reduced. Added new bat melee weapon which can be crafting from wood. 'V' now works for activating flashlights. Also works with new headlamp. Lock highlights now move correctly with the doors when open. Max inventory weight is no longer reset after rejoining a server. Particles are now pre-loaded during initial game load to help performance. Flashlights now play put away animations. Item dropping and picking up server side performance improvements. Items dropped from the inventory are now placed where the player is looking rather than a fixed drop point. This functions as a quick way of placing items and stops players dropping objects through walls. Can no longer open the inventory while in placement mode. Altered physical loot system to allow more control of spawned items. Changed all battery variants to stackable. Updated descriptions for AA and D batteries to show their usage more clearly. 9V and C batteries disabled. Only D and AA baterries will be used for now. STN logo removed from game screen. Weapon avoidance is disabled while playing the grab affect. Door handle interaction time is now quicker. Door handle colliders are now bigger to make interaction easier. Headlamps and low level battery powered items now use AA batteries. AA batteries are now harvestable from new battery stand. New AA battery stand can be searched for batteries. Hatchet now break correctly when reaching 0% condition. Reaching and grab animation now plays when trying to harvest items. Weapons no longer always spawn with 0 condition. Flickering reflections on weapons reduced. Resolution drop downs now fixed so that players can always select an appropriate resolution. New headlamp drop added to the game. Zombies no longer climb out of windows during the day without reason. Second log of oak tree no longer breaks. Picking up an item now cancels the animation for consuming. Fixed issue where the player would fall through the ground when joining the server. Radiator fan box no longer appears really close to the player. New headlamp added as a starting item which which is designed to make night gameplay easier. Cooked pots and meat variants now have clearer textures to indicate when cooked. Cooking objects now transition to cooked state in the same position rather than just above. Placing objects on the cooking surface now start cooking quicker. Items can now be picked up from cooking surfaces. Added notifications to cooking which aid the player as they learn the system. Clearer cooking pot variants to indicate when a pot contains uncooked, cooked or burnt items. Cooking burnt meat no longer spams errors to the log. Grill now snaps into position over the fire when in placement mode so that it's easier to get it in position. Old notification system removed as it could become cluttered and confusing. New unimportant notification systems added which is located in the top left of the screen. This handles repetative information that isn't always needed by the player. New Hint system added which handles important information the player needs. Located in the lower right corner of the screen. Added system which limits the amount of times any single hint can play. Removed old item hover info which we felt was too big and confusing. Added new hover system which includes icons that animate to show further information when looking directly at them. Improved notifications for missing parts when trying to place locks. Player now gets a hint showing the tool they are missing when trying to search for items. Updated cooking particles to make it more clear what cooking stage an item is in. Added new boiling sounds for items in pots. Removed the [Add] [Minus] buttons next to the item name in the crafting window. Added [Search] and [Recipe] buttons next to the item name in the crafting window. [Search] allows the player to 'search' for any recipes that include that item. [Recipe] show the recipe for that item. Updated the 'How to craft' section of the crafting page to make it easier to understand. Craftables that can't currently be crafted now show in the craftables list as grey. Craftables in the craftables list now hover red to show that they can be clicked on. Grey recipes also hover ready and can still be clicked on to show the player why they cannot craft the item at this time. Added a string in the crafting list view that explains what the search results reflect. Added label to craft-able screen that says 'Items produced' so that it's clear you're about to craft. Changed the functionality of the [clear] button in the crafting page to mean 'clear search' since recipes in the old way are no longer used. [Take] buttons now go grey when you can't take from the container. Top title on the items page now says the category name instead of just "Backpack" on all tabs. Added read out when hoving over consume buttons that display how consuming that item will affect your players stats. Inventory items now sort automatically on pickup rather than getting added to the bottom of the list of items. Stats button in the inventory now points to the correct page. Added support for placement mode right from the inventory. Activated by holding shift while in the inventory and pressing the [place] button. Added highlights to top category tabs in the inventory that indicate when you have new items per category. Zombie path finding iterations tweaked. AI should now be faster at caculating closest point to player when they are unreachable. Zombies can now get on sofas so that players cannot stand on them to get out of reach. Zombies can now get on dining tables so that players cannot stand on them to get out of reach. All house interiors redesigned to improve asthetics and player/ai navigation. Tweaked Gas station models to improve looks. Added AA battery harvest points in Gas Stations. Consumables that don't have animations now give the player a notification so that it's not as confusing. Weight change now displays in the inventory when taking items from containers. Players now receive a hint when login off which explains the safe log off mechanic. Starting calories is no longer 0 and is 2000 so that the player doesn't start hungry. Removed collision with some small trash piles so that the player doesn't bump into them as they walk around the world. Containers now have a 'Take all' button. Hand and flashlight base damaged increased. Shortened nights create a better game loop balance. Pain killers have been changed to Antibiotics and now have a 100% chance of improving sickness. Light switches now have a colored label to show if they are on/off. Pass over all drops to disable all that are not useful. New AA battery stand added. Various hard case suitcases added. New large fixed campfire type added. Teleport map now closes when the main menu closes so that it cannot overlap on opening other UI. Server config description for loot value updated. ./CleanUp command now works correctly again. Fixed scenario where zombies could get warped back to previous object that was climbed over. Picnic benches worn plank and nails harvest now working. House 3 double interior now fixed. Cabin 6 interior now has collision. Fixed dupe glitch with containers when taking a stack of items! Free placed shotgun trap added which takes 12 gauge ammunition. New variant of the placement mode system added for bigger (Traps/Generator/Campfire etc. ), the system aligns items to the terrain/ground and makes sure the player can’t place items on steep surfaces. Placement mode collision with buildings fixed, this prevents players from placing things inside of walls. Fixed issue with the in game terminal which was causing the game to lag. Fixed issue with world initialisation which was causing the server to lag when new players joined. Fixed scenario which would allow the weapon to slip into inspecting when searching area for items. Weapon avoidance now works again on buildings. Changed the guide page of the player inventory to "Coming soon" to save confusion. Fixed glitch where zombies would snap on to roofs when walking through door ways. Items dropped from a stack in the inventory no longer have the same identifying ID which was causing issues where things would sync to the wrong items. Added crafting recipes for shotgun, fire and bear traps. Mouse invert option now works again. new worn and fresh plank drops added. Bear trap model tweaked to make contact with ground better. New tweaked bear trap animations added. Window frame positions and centres updated for Zombie traversing. Improved 'Killed by' UI notification. Zombies no longer glitch on top of roofs when passing through doorways. Players and AI will now catch on fire and take damage when walking into a propane fire wall trap or a campfire. Impact force added to player and zombie ragdolls when receiving gun or explosion damage. Zombie scales now tweaked for traversing through window frames. New hammer attack animation added. Tweaked physics default solver iterations to improve ragdoll stability/jitter. Zombies character rig and animation overhaul to allow for more precise animations and rag dolls. Improved rag dolls for zombie AI. Water bottle drinking proxy animations improved. Zombie climbing through window animations added. Reduced amount of time it takes to search area for items when holding F.
Improved the notifications when searching for items. Fixed issue where player vitals weren't always being written to the database on log off which would result in out of date stats on login back in. Fixed AllwaysSafeLogOff perm so that it now always store up to date log of position. Wilderness cabins now contain more storage containers. Added design around new player spawn locations to help direct new players. Fires now start with a few items in them. Added tips to loading screen! Updated generator GUI so that quantity no longer shows 1/1 and now displays the fuel amount. Reduced time it takes to start generator. Added [Interact] button to fires to match other machines. Updated fuel display on fires to simplify it and match with generators. Fixed radiator that was sticking through wall in stripmal variant 3. Fix for game starting in windowed mode. Fix for hidden servers not working correctly. Reduced overall size on disk for game from aproximately 10.5gb to 8.5gb. Fixed broken UV's on low quality water. Dead/Ragdoll characters no longer fall through roads. Fixed issue where not all items that should be spawning were being chosen. Weapons now hide correctly when in placement mode. Shooting locks no longer leaves a floating impact decal. Own shadows now move up and down when looking around. Lock hasp and staple visualisation no longer casts shadows. Fixed issue where floating impact decals would be left after shooting a light bulb. Updated light bulb smashing effect to make it look nicer. Improved initial player spawn locations to create a more emersive new character experience. Added reload complete notification which gives info about loaded ammo and remaining ammo in the inventory. Reload and consuming actions are now considered finished when the animation is 80% complete. Previously the player could open the inventory and accidentally cancel an action when it appeared to be finished. Can no longer open the menu while in the player list. Added walk and sprint lock support. Press = key while holding either walk or walk and sprint key to lock input. Server IP now displays as name for servers that don't have a name input. Player no longer freezes when escape is pressed to gain access to the menu. This could result in players being frozen in mid air. Re-added correctly working kitchen container locks which had been removed in the previous build due to issues. Improved melee impact sounds including punches. Pills in pill eating animation are no longer pink. Inspect readout now correctly shows overall health instead of calories in the overall health section. Hotkeys no longer work while in the map. Hitting locks with melee weapons now deals damage to the lock. Added ability to hit doors to damage locks. The first available lock will take damage. Fixed issue where the player could be unlocked while still in the menu when pressing escape to close the terminal window. Added battery requirements to descriptions of flashlights. After being in unity 5 for over a year we felt with this update it was time to upgrade to newer version the engine. This will allow us to take advantage of newer features/optimisations and not fall behind on supported Unity builds. After extensive testing of the newest unity releases we felt that Unity 2017 LTS(Long Term Support) offered the best upgrade and stability at this time. Listed below are some of the advantages of upgrading the engine. Culling of shadows casters in 2017 has been optimized, this means there will be less objects casting shadows resulting in better performance. Improved filtering algorithms should also improve the look of the shadows aswell. The new unity update also includes improvements to the loading times of scenes and assetbundles. These changes and several other small fixes we've made should help reduce the lag spikes when walking around in the world. New tweaks to the particle system will allow us to create more realistic and optimized effects. Staying on newer builds of unity keeps us up to date with the newest features and support. Optimised shader parsing during environment load which was causing spikes in performance. Reduced memory garbage allocation associated with debug GUI in bottom right corner of screen. Reduced memory garbage allocation when loading terrain environment. Slowed the rate of world loading to prevent too many assets being set active in a single frame. Improved scene unloading which could cause hiccups in fps. Asset preloader added which pre loads assets during first load into game. Helps with large lag spikes caused by initial load of assets. Enabled vsync by default which limits framerate to 60fps and stops the GPU running at 100% usage unnecessarily. Terrain in distance no longer casts unnecessary shadows. Reduced waters overall GPU overhead. A project wide review and optimisation of over 3500 textures. Removed some lag caused by player foot step sounds. Improved performance to tree loading as the player moves around the environment. Fixed large lag spike being caused by unnecessary reloading of terrain related textures. Fixed lag spike being caused by premature destroying of terrains during world unloading. Fixed lag spike being caused by unnecessary calculation. Added 2 hospitals to the map and relevant surrounding design. Fire station exterior design improved. Added signs to police and firestions. Improved exterior design around police stations. School desks now function as containers. Several police and fire station specific props added. New signage added for fire department. Can be lit with electrics. New red rolling garage door variant added for fire station. New red door and frame variants for police and fire stations. Fixed strange effect on carpark in terrain 8. Fixed scenario where roofs could have snow on them when they shouldn't. Outhouse toilet building loading distance fixed. Tweaked position of police stations. Added hosptial building to the game. Added Interior design to the fire station. Added New floor material for the fire station. Added design to the police station. Church reworked and designed inside. Added locker variants. School and armoury types. Added meter and breaker to school building so that it can now be powered. Added meters and breakers that were missing on buildings House_Wood_3_variant_3 and House_1_variant_1. Fixed floating roads on terrain 27. Fixed several materials in the finishing town that didn't have use effects. Fixed missing material on truck docking area in large grocery store. Fixed issue where spawned items could start with 0 condition which resulting in them being able to have negative condition. Fixed purifying water with purification tablets. Fixed names of instant potatoes. Fixed beets that had duplicate names. Fixed energy bottles drinks which had wrong names. Added physical spawner locations to residential building interiors. Fixed moulding in strip malls that were out of place. Changed strip mall interior loading range so that it’s not so obvious when it turns on. Removed double bar prop in string mall variant 3. Fixed missing pole on gas station sign. Rain no longer falls through large popov grocery stores. Fixed shelf that was clipping in variant 3 popovs. Counter in popovs now have collision. Increased the range that the interior loads in at for popovs. Interacting with the generator no longer plays the take animation. Fixed clipping tool boxes on large building roof top. Collision with fence on top of large building roof top now works. Zombies no longer walk through large apartment blocks. Shopping cart LOD transition improved. Moved sink cabinet in house_9 that wasn’t against wall. Fixed floating shadows when having the r-6804 equipped. Zombies should be jumping into swimming pools again. Fixed issue where some trees wouldn’t spawn appropriate pickups. Improved floors material in school building. Fixed terrain where it was clipping with floor in terrain 44 and 52. Removed lawn mower prop as it was low quality. Moved props that were blocking several electricity meters. Cooking items no longer duplicate. Missing door slam open sound assigned. Fixed MRE drop and reduced overall stat gains. Fixes to typenames on energy drink drops. Fixed typeName on potatoes cooked. Fixed typeName on beets cooked. Tree piece pickups are now the correct scale. Gravity now instantly activated on items that exit placement mode..
Easy way to access Inventory crafting and guide tabs. Inputs i o and p now open the inventory to relevant tab. Fix for infinite stamina glitch when locking inputs. Inputs no longer get stuck when entering/exiting chat. Command accepted no longer goes in to the chat multiple times when inputing a command. Stopped all player stats being able to go negative or higher than their max amounts. Switching weapons has been optimised. Reduced radius in which zombies are cleared up when a player spawns nearby. Fixed errors when attempting to remove items from the world. Fixed scenario where you could enter game, exit and then rejoin but not keep your persistence. Fixed issue where starting items weren't persistent through relogs. Added physical loot system which spawns relevant loot around the world. Added player network relevance system which stops state sync when you get far enough away from each other. This limits bandwidth and disables the character model as well. Added pickup network relevance that makes network aware pickups on only relevant to the players within the set range. This also turn off the models which saves on rendering and LOD calculations. Added pickup placeholder system which turns pickups into none network aware objects when no player is relevant. Adaptivly changing music based on time and situation. Improved server search and 'Clear History' buttons layout. Added Server filter toggles to server selection menu. Options include: Compatible, Private and unofficial servers. Player list is forced off when being disconnected from the server. Added triple monitor support for all menus. Pressing enter/return now exits placement mode. Smoothing added to items that are in placement mode so that they’re not as jittery. Fully disabled plastic tote pickup until spawnable containers are implemented. Animal trap crafting recipe now takes 4 planks. Adhesives bandages weight updated to make it more realistic. Empty water bottle weight updated to make it more realistic. Gun cleaning kit weight updated to make it more realistic. Saucepan of boiling water weight fixed to match other items. Shop specific props added. 250 new items in total. Large grocery stores have been fully redesigned. Added new rooms in large grocery stores to make them more realistic. Stripmals have been fully redesigned using new props with all new pharmacy, bar, weapon, hardware stores and more. New store signs have been added. Most take power and can be lit. Strips malls variant have been evenly spread between towns to fairly distribute loot. Collision with shower head fixed. Parking islands now have collision. House_5 interior now has collision. Added electrical breaker and meter panels to house_4_variant_2. Fixed door alignment in House_Old_House_variant_2. Improved textures in junk pile. Kitchen cabinets are now easier to access and open. Fixed floating cabinet in large exterior junkpile. Added collision to door frames in school building that were missing. Raised message board that was stuck in the ground. Removed remnant collision from carports on plaster variant houses. Fixed trashbag variants that where incorrectly showing interaction information. Moved clipping rain barrels from building. Moved trash can that was clipping the ground. Improved fluorescent light smash particle. Zombies now jump into swimming pools. Added /chat on/off command which enables or disables the chat globally. Reload sound fixed on r-6804. Shotguns can now damage locks. Wind up flashlight attack animations now play for others. Flashlight inspecs now work again. This was also breaking weapons. Lock kits now spawn in various containers. Tweaked electrical items spawns so that they're a bit more varied. Generator no longer starts with parts. Electrical meters no longer start with parts in them. Windup flashlight no longer casts incorrect shadows. Small work bench should no longer spawn and can only be got through crafting. Fuel extraction points now work more consistently and take the correct amount of fuel for the containers you have. Fuel extraction points now run out of fuel. Worklamps now cause the generator to burn fuel quicker. Single input commands that take no arguements now work again. /Help command should now be working again. Fixed issue where certain items would turn into cardboard when being dropped or moved into containers. Tree stems should no longer disapear after being cut. Generators no longer stack in the inventory. Fixed generator turning on when dropped for the first time. Generator wasn't actaully on, only the effects. Fixed issue which stops server restarting after crash without a db reset. Cause of initial crash still needs identifying. Please report any info you can figure out regarding it. Added ability for items to turn into other items rather than being destroyed when they are empty/0 quantity. Example: water purification tables can now turn in to empty card board box. Now possible to log off at bus shelters. Shooting door handles no longer shows decals hitting an invisible box around them. Game volume no longer resets to full volume between play sessions. Fixed weird spelling on coffee pot texture. Added coming soon UI to the radiator. Added coming soon UI to the Coffee pot. Fixed issue where sounds could be incorrectly heard after death. Pressing interact key on dirty water sources now opens the inventory. Weather now syncs with other players when first joining the game. Previously it was only updating after the weather changed again. Significantly increased the burn time of fire wood and coal. Fires can now in theory last through the night. Other players flashlights should always be visible to each other now and be persistent when joining the game. Zombies take longer to disappear after being killed. Notice boards now give maps. Players now do varied amounts of damage to locks dependant on what weapon they are using. Zombies now do less damage to locks. Zombies now have a chance of giving up when attacking a door. Improved fuel cap lid model to make it more clear. Pallet variants now spawn electrical items based loot. Fuel burns quicker based on the amount of load on the generator. Generators now stall when load becomes too much. Breaker panels now blow breakers and trip the power when the load is too much. Generators now have startup, miss start and dying logic and effects. Fuel station signs now works. Electric garage doors now work. Sinks now provide clean water when pumps have power. Fuel station pumps now provide fuel when station is powered. All light bulb types can now be shot and destroyed. Added work light variant that is triggered by a movement sensor that can be triggered by players or Ai. LED indicator light added to generator. LED indicator light added to meter and breaker panels. Off = no power, Red = power but inactive panel and green = power and active panel. LED indicator light added to various other machines that require power. Lights now have a chance of randomly flickering which is synced on all clients. Fixed scenario where [Add] button was missing when trying to add fuel but can’t. Now displays grey [Add] button for clarity. Jerry cans no longer stack. Generators now spawn with some parts. Generator fuel tanks can no longer be removed and act as a fixed attachment. Added fuel gauge to generator GUI to better indicate how full the tank in and added button for taking and removing fuel from that location as well. Electric meter and breaker panels now have animated leavers. Improved switch/lever model on meter and breaker panels and reversed direction. Moved runtime remaining display under generator picture. Added [Interact] button in the generator UI next to the new fuel gauge which allows you to start the generator from the UI. Added [Take] and [Place] button next to new [Interact] button which lets you pickup or move the generator. Added [Interact] button in breaker and meter panel UI’s so that they can be activated while still in the UI. Added indicator light in UI for generator, meter and breaker panel. Added indicator light key to UI in the generator, meter and breaker panel to help guide players. Fixed issue where parts couldn’t be moved to a generator from the inventory using the [Move] button inventory. Changed required parts for the generator to make them more realistic. Worklamp light intensity increased significantly. Freestanding lamps now have a [Interact] button in the UI instead of an independent switch. Generators now only power meters that are within 5m. Generators, meter and breaker descriptions no longer run off screen. Added fluorescent light type and placed them around the world in appropriate locations. Added additional particles and sounds to lights and electrics. Clicking the search bar in the crafting menu while crafting now cancels the current craft. Fixed the width of the craftable names in the search list view that were being cut off too soon. Updated [Minus] UI in the inventory so that it no longer clips the ]. Changed greyed out [drop] buttons to greyed out [minus] buttons while on the crafting page. Stopped the crafting sound getting stuck in an endless loop when clearing or canceling the current craft. Removed cleaning with dirty rags craftrables. New small workbench is now craftable. Crouch height changed to bring it in line with how the proxy characters look. Smoothed out crouch motion and made it feel more natural. Added slightl bounce at end of crouch to make the motion feel more fluid. Added slight head raise when moving while crouched (Matches motion proxy animation makes). Added slight head lowering when moving while standing. Increased speed of transition between crouched and standing. Mouse sensitivity now correctly matches your previous play session. Player steepness checks improved and are now more accurate. Particles added when sliding on surfaces that are too steep. Player can now walk up steeper slopes. Players can no longer spam jump to get up steeper surfaces. Player is now pushed away from the surface being jumped on. Camera jolt when landing from a jump is more intense based on the Y velocity. Water bottles no longer get destroyed when filling from a dirty water source when you have more than 1 empty bottle. Can now move water between saucepans and bottles. Fixed floating road on terrain 57. Reduced reflections on tv screens. Fixed floating road on terrain 35. Fixed texture seams in House_plaster_10 model. Replaced ceiling material in house_plaster_10 model for something more appropriate. Moved floating bushes on terrain 31 to the ground. Moved floating stone wall on terrain 38 to the ground. Fixed water clipping through the ground on terrain 30. Missing water added on terrain 27. Moved floating bushes in scene 52 to the ground. Moved tree that was clipping rock on terrain 37. Added bus stops to entrances and central areas in towns around the island. Improved performance while firing weapons. Fixed scenario where reload sounds were being unloaded incorrectly. Most noticeable on progressively reloaded weapons. Fixed scenario that would make the ammo in weapons go out of sync. Added pull start pickup for generators. Added carburettor pickup for generators. Camping tripod now requires metal rods to craft. Purification tablets name updated for clarity. Mugs can now be cleaned via crafting. Fixed the tackle box drop so that it is now a tackle box. Various new consuming animations that were previously missing. New generic eating animation for items that don't have a dedicated animations. Fixed clipping animation when consuming canned items. Fixed clipping lola&garrry handgun inspect animation. Wood stove door now has animations for opening and closing. Added kill command chat return which gives detailed information about what was killed. Deleted or re-id’d items no longer break the inventory for players that had those items when they last logged off. Audio issues that stop the sliders working as expected. Player should no longer be able to get stuck in shipping container by jumping on boxes. Shooting glass in middle of exterior doors now shows glass particles. Shooting through gaps in glass on exterior doors no longer shows particles. Wood in the the middle of the exterior doors is now penetrable. Drinking energy now notifies player of stamina change. Improved inventory item resource checking methods so that it can now aggregate the items with resources. Fixed issue where you would sometimes not be able to un-crouch or jump. Added craftable lock kit which is crafted using all the individual parts you used to use to fit locks. Stopped hotkeys working while the equipped weapon is being cleaned (this previously broke the inventory). Fixed issue where consuming items that didn’t have animations could break the item consuming. Changed logic so that switching away from a jammed weapon takes slightly longer than usual (this previously broke the inventory). All [Eat] [Drink] [Use] buttons go grey while consuming another item to save confusion. Fixed issue where hotkeys would go out of sync if you equipped a weapon from the inventory or moved the equipped weapon to a container. Fixed issue where canceling consume animation would break all other consuming. Locks are now persistent through server restarts. Added notifications for all lock operation from placing to to locking. Fixed scenario where only one lock on each door could be interacted with. Locks no longer spam errors when there are multiple players on the server. Fixed issue that was allowing the inventory to be open while in the lock UI. Added functionality to resetting code locks after they’ve been set. Added button on lock UI which points to the wiki page. Changed lock placement objects so that they now take lock kits and not all the individual parts. Lock code input wheels now move smoothly. Materials on lock UI improved so they glow correctly. Added ability to click the hoop in the lock UI which will snap the lock shut. (0.3.5) Locks are now much more resistant to player damage making them much more useful. (0.3.5) Weapons do different amounts of damage to locks now rather than a default range. (0.3.5) Zombies are now drawn to flashlights. All flashlights are now capable of attacking. Spamming debugs on server for flashlights removed. Flashlights now have inspect readout. Can no longer start charging wind up flashlight while in the map. Melee weapons now have inspect readout! Flashlights now have inspect animations and read outs. Light colours and intensity updated on all flashlights for better balancing. Cookies assigned to all flashlights. Small flashlights both led and non led say they are small in the name now. Large flashlights both led and non led say they are large in the name now. AI now takes significantly longer to break open doors with locks. Zombies can now retarget after starting to attack a door. Minimum amount of attacks for a zombie to open an unlocked door has been increased. Situation fixed where zombie could walk through doors if there was a player near by but the zombie wasn't moving towards any sound or had any targets. This would only happen if the player is in god mode or if the player has more than the max amount of zombies chasing him. Improved zombie player awareness when interacting with or through doors. Added lock kit pickup which is now used instead of all the individual parts when fitting a lock. Canned items now have the correct prefix in name. All items in sauce pans now have the correct prefix in name. Fixed the size of the collider on the tea candle pickup. Fixed capitalization issue in energy drink name. Oats now turn into the correct object when cooked. Canned sausage now turns in to the correct object when cooked. Canned dog and cat food now return empty cans when consumed. Boxed Spaghetti and potatoes now return empty cardboard when consumed. Cooked tomato soup new returns the same Cals as the uncooked. Cooked pineapple now has 0 sickness chance. Fixed the inventory spacing/alignment issues in the tabs after All category. Removed the [-] that wasn’t used on the inventory tabs. Fixed capitalization on ‘You’re too fatigued to jump’ notification. Added name scaling in the inventory for item names that are really long. Given the name width in the inventory more space. Coming soon UI added to propane grill. R-6804 Jam speed is now slightly faster. Melee damage tweaked on some weapons for balancing. Consuming energy drink now plays drinking animation. R-6804 Jam animation no longer clips the scope with his thumb. Hatchets now work for chopping trees. Hatchets now work for hitting enemies. Melee tree chopping precision improved. Fixed chair on prop_wooden_table_fallen.fbx which was angled unrealistically and was defying gravity. Fixed stretched textures on prop_wooden_table_fallen.fbx. Door lock positions moved away from the handles so that interacting with the handle is easier. Gap in guardrail fixed on terrain 50. Floating pallets on roof of projects building fixed. Clipping pallets on roof of projects building fixed. Floating signs on terrain 43 fixed by moving them back to fence. Fixed clipping desk clutter in house 6 variant 1. Trees near cliffs in Sage Creek are now at the correct height. Fixed clipping display cabinet and shelving in plaster house 9 variant 4. Fixed missing light switches in plaster house 10 variant 5. Improved doors clipping walls in project building (full model rework will be required). Floating roads in multiple locations. Terrains 23, 27 and 51. Fixed terrain clipping through parking lot on terrain 19. Removed grass from building on terrain 35. Fixed broken railing on bridge on terrain 29. Fix for Far LOD never changing to real trees in some instances. Snapped floating rocks on terrain 44 to the ground. Added metal exterior doors to the back exit of large grocery stores. Fixed meshlink fencing on prison island. Fixed fencing around dock on prison island. R-6804 Jam Audio Updated and is now in sync. a2z typing intro volume reduced. Zombie agony and attack sounds improved to prevent overlapping. [Use] button inventory for the map now closes the inv and opens the map. Fixed issue where some stats couldn't be affected negatively by consumables. rauser rig no longer has disapearing hammer. Server time persistence improved. Now fully fully persistent through build updates and server restarts. Reseting the database will clear the saved server time. Gas stoves no longer spam log about cooking zones and now have colliders so the player cannot walk through it. Notification que limit changed to 3. This stops it being confusing when multiple notifications are required. Fixed 2 scenarios which were definitely causing zombies to become invisible! We're hopeful that this is all ways but we can't be 100% sure at this time. Improved zombies network usage. Zombies should use about 50% of the bandwidth they were previously using. Zombie movement should now be smoother overall regardless of ping. Fixed scenario where zombies could get stuck on the wrong side of a door and still be trying to attack it. Fixed scenario which was allowing zombies to walk through doors. Zombies now always try to open doors if there a player near by. Zombies should no longer be able to attack players through walls and doors. Fixed scenario where zombies would become unresponsive to certain players. Zombies no longer become glitched and scream repeatedly. Movement trasition between idle and running is now more smooth for zombies. Zombies now face you when screaming after being alerted to your presence. Zombie ragdolls improved. They should now fall more realistically. Pub/Bar cupboards now work as storage containers. Barbers shop counter now works a storage container. Tweaked the quality of items spawned in the file and bedside cabinets. Haybales can now be searched for tinder. Interact hold down changed from 8 to 4 seconds on dead trunks harvest points. Fixed the cupcakes 50% to now drop cupcakes 25%. MRE pickup is now consumable. Tea candles pickup should no longer become invisible. Canned Dog food now shows as food and not drink. Canned cat food is now shows as food and not drink. Canned pineapple is now shows as food and not drink. Beets now have correct naming for different variants. Bleach now correctly setup as a consumable. Crafting recipes for energy drinks added. Red or Green berries + water will give weak energy drink. Red and green berries combined + water produce stronger variant. Cardboard is now correctly consumed when crafting tinder from cardboard. Clean rags can now be crafted into bandages. Can now sharpen axes, hatches and combat knives using the sharpenning stone. Barrels clipping through wall in House_Farm_House_variant_1 at x1228 y -8 z-524 now fixed. Sidewalk clipping through building House_2_variant_1 at x-1080 y54 z984 now fixed. Terrain clipping through building floor in House_9_Variant_4 at x-1112 y54 z1020 now fixed. Grass clipping through some buildings now fixed. Various building in the wild will still have this issue. Removed hanging plank of porch on TwoFI_Brick_WDeck_2.0 which would glitch the player when being walked in to. Improved building variants in Addersfield. Floating junk in subsector x-4_z-10 has been removed. Floating rocks in subsector x7_z4 has been moved to the ground. Floating fence piece in subsector x-2_z-5 has been moved to the platform. Floating house in subsector x12_z-7 has been removed. Floating sign on terrain 61 fixed. Hit particles, decals and impact particles on most items are now correct. Most surfaces will now have their own effect set. Waterfalls are no longer too bright during the night. Added /Stuck command. Attempts to free the player if they are stuck for whatever reason. FRKS jam animation now syncs with sound. Tablist no longer updates 1 player at a time when refreshing. Kitchen cupboards hover UI now in the correct location. Quicklink URL's now point to correct links in the tablist. Fixed egnative to negative in the overall health description. Start color of loading circle made less transparent to stop it being invisble when holding E (especially if the interact time is really long). Loading circle is now perfectly centered. Notifactions added for item consumining from the inventory. Kitchen sink hover UI now positions correctly. Changed fuels station man hole cap to coming soon UI. Fuel extraction currently disabled due to issues. Added perm for stuck command variants. Teleporting to a location no longer snaps you on to the roof or highest surface. Dresser no longer eats loot. Notes in quality settings menu UI updated to reflect changes. Shadow quality now updates when quality settings are changed. Improved water shader functionality for AMD video cards. Non lootable sink cabinet removed from large trashpile. Bleach can now be consumed. Has serious life limiting effect!!! Bandages no longer spam the log and should all work. Can now craft dirty water and purification tablets together to get clean water. Server time and month now display in the server list. This will allow new and returning players to find a server that isn't about to turn night. Particle culling spam in log removed. Night zombies now start to die closer to morning. Rocks covering entry ways into tunnels now have collision. Changed the name on the cooked green beans from: Green Beans (Uncooked) to Green Beans (Cooked). Lighter drop no longer shows as a weapon. Canceled crafting no longer plays the crafting complete sound. Added opening of crafting page of inventory when interacting with a workbench. Added hover UI to large workbenched. Contaminated trashbg junk pile now has collision. Fixed issue where buttons where being pushed off screen in the container window when the item in the containers weight would exceed the allowed weight the player can carry. Fixed instances where JunkPile_large_Outside_variant_4 had clipping issues. Lola and Garry Iron pistol cleaning animation now syncs with sound. Floating weapons on own backpack when croucked and looking up should now be fixed. Fixed items spawning in containers with too many resources. Example: Fuel can would spawn with 35/20 resources where it should have been capped at 20/20. Fixed inventory showing 'Resources remaining: ' as the the quality. Now correctly shows the resources left. Drinking dirty water bottle now plays drinking animation. Servers now show in Steam server browser. Sway and weapon movement tweaked on all weapons to match head bobbing after recent movement speed alterations. Server loot tables changed slightly to add a bit more loot (We're still balancing this and there's no physical spawners still). Server are searcheable in the server list view. Server are now sortable via the top tab buttons in the server list view. Can be sorted by favourites, name, region, player count, ping, password and version. Zombies should no longer walk through door panels when the door is open. Zombies no longer try to open doors unless they are actively seeking something. Revised night spawning zombies start point to make it slightly earlier. Changed calorie tolerances for overall health calculations. Murders commited that day no longer carry which makes changing overall health fairer. Hydration now affects overall health calculations. Player notificatin system added which cleans up the chat and informs the player a bit better. Added notification and hint when pressing M (map) without a map in the inventory. Fixed issue with water culling which may have been causing a RAM leak. Fixed issue where building interiors would load double resulting in broken doors and other containers. Fixed issue where building interoirs wouldn't load at all! Fixed issue where building interiors wouldn't load if you spawned inside of them. Nails and screws will now spawn with quantity. Prevented hotkeys working while in UI. Punching precision improvements. Punching should feel more natural now and connecting punches should be more satisfying. Day zombie amounts overhaul. More zombies in buildings and more randomly spread out through world. Improved the layout of large trash piles so that zombies can traverse more easily. Improved player spawn point positions by moving them closer to roads. This should help new players find their way when first entering game. May need further balancing. Fixed item highlights when searching the area for items using F. Highlights are now slightly brighter too. Added lootable racks in fuel stations and bus shelters where maps can always be found. Added Compass which aids in finding your location on the new map. Doesn't currently function as an actual compass. Only to show position on map. Added Map to game that only works when you have the map pickup in the inventory. Coordinates now stay in bottom right corner after resolution change. Fixed large standing fridge which had floating glass door in some instances. 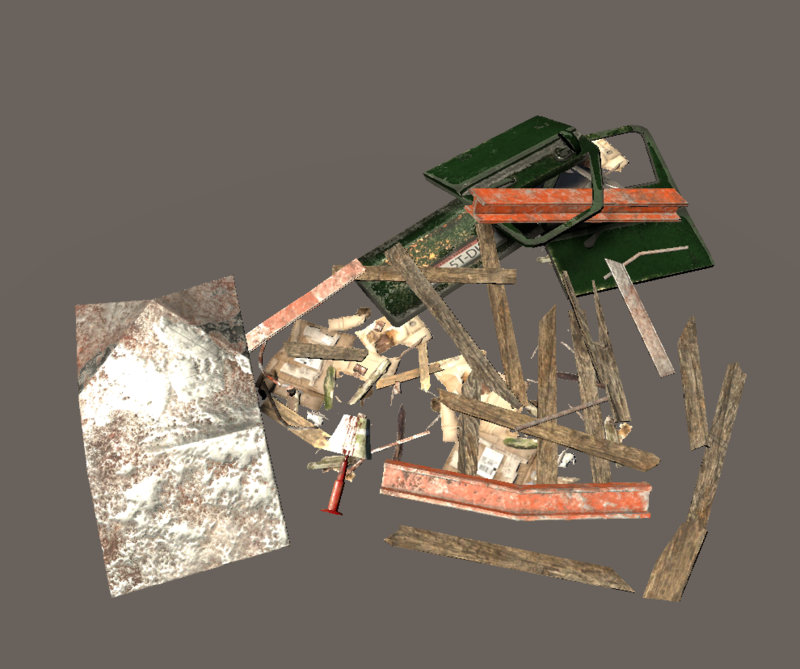 Fixed large junk pile that zombie could get stuck in. Glass shop counter now has improved colliders. Items no longer float on top of it where the glass should be. Fixed furthest LOD on plaster house. Fixed scenario where players get in game before load is finished. Door out of place in House_Plaster_10_variant_1 fixed. Audio listners are never double or none now meaning there's no spam in the log. Fully disabled items no longer spawn in containers. Hatchet handle can now be crafted with A Draw knife, Combat knife and a Kitchen knife. Hammer handle can now be crafted with A Draw knife, Combat knife and a Kitchen knife. Axe handle can now be crafted with A Draw knife, Combat knife and a Kitchen knife. Rags can now be cleaned with both washing liquid/bleach and water. Campfire tripods now need to be made with 3 angle irons. 3 pieces of chain A grill and 2 pieces of wirespool + small workbench. Added Dirty Water variants to all craft able foods (Rehydrated). Added Clean Water variants to all craft able foods (Rehydrated). Added Dirty variants to all craft able foods (Rehydrated and pot of ...). Treated bandages now take 5 seconds to craft. Animal traps now require 24 nails 5 Wire spool to be crafted. To clean a pot you now need water. Pots can now be cleaned with both washing liquid and bleach. All canned food now gives 5 times less hydration as standard. Purification tables now have a max amount of 2 per box. Lighter drop made slightly larger. Medical cabinet no longer spawns consumables, limiting it to medical items. Lowered the spawn chance on file cabinets. Removed consumables from spawning in crates and increased the chance of generators spawning in thse. Removed consumabled from spawning in toolchests. Added hand held radios to the cash register. Increased the chance of finding melee weapons in foot lockers. Increased the chance of finding food in fridges. increased the chance of finding food in gas stove. Other player don't drop loot currently. This will be worked on and implemented once move-able containers are working. No physical loot spawning. We're trying to balance and fix the issues with the container spawning. By design the containers were meant to spawn less weapons/ammo since they were meant to be physical drops. Containers will start spawning ammo and weapons in 0.0.5 until physical spawning is enabled again. Ammo goes out of sync sometimes in weapon. Hopefully fixed in 0.1.0. requires a lot of testing. Doors sometimes don't initialize correctly which makes them appear closed when they're actually open on the server. Since they are open on the server, zombies appear to walk through the doors. Zombies are sometimes invisible on some clients. Fixed issue where the player occasionally gets thrown into the air. Respawn should work now all the time. Zombie movement speeds adjusted against the player movement changes. Player stamina now regenerates at a faster rate when walking and idling. Player running speed increased slightly. Player walking speed increased slightly. Player camera sway tweaked slight so that it always returns to the center. Zombies now transition from walking to running more smoothly. AI path finding precision has increased. Night zombies when turning day now have a higher chance of dying instead of finding a building. This stops there being too many zombies in buildings during the day. Fixed axes and hatchets not taking damage correctly when chopping trees. Walking under bridges no longer snaps you up on top of the bridge. Pickups should no longer fall through buildings. Pickups should no longer fall through roads. Ambient environment sounds now transition over time. Improved messages in bottom right corner during load to help diagnose connection issues. Container loot will no longer spawn if there are players close. Container loot will no longer despawn if there are players close. Extremely long nights during the winter have been reduced in duration. Prevented the coordinates being enabled and disabled to make finding issues from screenshots easier. Inverted mouse option now working! Inverted mouse option now saves last state. Safe log off points should now be fully persistent. Slightly longer join timeout allowance when connecting to servers. Connection interrupted during the loading screen is now fixed. Zombies should no longer walk through: All variants of concrete slabs. Exterior lights now show the correct bulb quantity. Style on popovs super market. Light switch visual transition from on/off should look nicer and will no longer throw warnings into the log. Hatchet melee attacks are now more consistent. Balanced volume of player panicking sounds. Balanced volume of player out of breath sounds. Added slight fading to stomach grumbling sounds. Fixed scenario where player wouldn't get kicked back to menu if steam authentication failed. Fixed issue where the player get locked in position after teleporting. Added hover UI to trees so that new players can see what items they need to chop down trees. Added highlight to fallen tree piece to match initial 4 chooping points. Added particles when tree impacts floor. Tree highlights now show up immediately on equipping and axe or hatchet when stood near a tree. Tree highlights now disapear when unequepping axe or hatchet to save confusion. Fixed bad rotation of chopping points on felled tree piece. Pieces now rotate and don't show gaps in stem. Fixed hatchet not working for cutting down trees. Fixed fallen trees stem piece not spawning in the correct location. Transition from tree to stem should now be smoother. Slightly reduced chance of axe or hatchet breaking when it has low condition. Ammo goes out of sync sometimes in weapon. Container loot situation improved. Loot will be more common and weapons and ammo will spawn more. Container loot stagnation will be reduced by improved looping and clear up of old stuff. Escaping from main menu now closes inner menus and removes their focus. Fixes scenarios where menu items can be interacted with while no longer in the menu. Fix for being able to glitch through walls by spamming the crouch button. Fix for teleporting under the terrain when the server is lagging. Various server and client optimizations. Sensitivty slider now instantly updates the sensitivity. Before this fix you had to press escape twice to update it. Stones removed from campfire crafting recipe. There will be an updated way of gathering stones in a future patch. Firewood craft times reduced for balancing. Regions now show correctly in server list. Lobby is experiencing technical issues, it will be going on and offline which means you sometimes can't join a server or you might get kicked. Scrolling through weapons now loops. Rifles, handguns and other items that can be equipped are now visible on the players backpack. Weapon hotkeys and scrolling finally implemented! Ability to organize inventory items. Giving items now gives an item of 100% condition rather than 0. Altering players stats via commands now works with negative numbers. Added some extra security for players trying to cheat their ingame status. Item page updated on wiki, new wiki format. New items added to item page. Impact particle effects that other caused now face the player as they should rather than facing directly away from the impact surface. Added fallback content logic for surfaces that don't have specific impact effects. Added player list GUI when pressing tab which displays information about all the players currently online. Allowed the player to skip the splashes once the preliminary loading is done. Any key works. Added additional splash screen of contributors. Added /lookup "partName" which returns a list of potential items. Ideal for server admins to save them leaving game to find item id's. Added "Clear History" button in server browsers history tab. Server browser tabs now work, History, Favorites and Owned tabs work. Friends tabs is disabled for now. Added bullet penetration for things like thin materials with a damage reducer dependent on how many layers and what object you hit. Bullet decals from other peoples shot are now seen in your client. Shotguns now have real spread. Added password input field to UI for connecting to private servers. Added some information messages when you are denied connection to the server. Banned, to many players and so on. Chat messages now log to console for server admins. Added option to insert the server owners steam 64 ID right into the config so that it will give you all perms when joining the server. Added option for server owners to choose the starting items players get on first. Added PvP toggle in server config file for server owners. Added /CleanUp radius and relevant perm so that server owners can clean up interactive objects in the world incase of trash build up or broken items. Added * perm so that all perms can easily be unlocked for a user group. Got rid of old /help /HelpAdmin commands and replaced with /help for all user groups. Some general information is returned about yourself and a list of commands that your user group has access to. Now possible for server owner to set the color and name of the "[Command]" and "[Whisper]" prefix's. Added command groups to user permissions for easier group creation. Server moderation changeable username colors. Chat no longer closes with "return" key unless the message input field is empty. Meaning the chat no longer closes automatically when sending a message. Total revamp of chat system, introducing tabbed chat windows for a sleeker and neater chat. Additional server configuration added, server owners can now set up groups and assign permissions! Numerous chat commands added for players and mods such as /Warp and /Whisper /StarterKit etc. /Weather on/off command added to disable random weather (admins and higher). /Weather Clear/Light rain/Heavy rain/Storm/Light Snow/Heavy Snow/Snow Storm added to force the weather type (admins and higher). /Forceweather Clear/Light rain/Heavy rain/Storm/Light Snow/Heavy Snow/Snow Storm added to force the weather type without transition (admins and higher). /Month command added for server admins and higher. Added /DeleteAll command for moderators up. Added /DropAll command for moderators up. Small pine bush variant added. Updated tree textures and substances. Reduced tree sound ram usage. Added /Reply command for sending a private message back to the last person who pm'd you. Command also works with /r. Example /r Lets steal all his stuff?. Added /Tell command for sending private messages to other players. Example /t _JB lets KOS this guy (Evil laugh). Added /TP string string command which teleports a player to another player. Example /TP _JB Runelink2 would teleport JB to Andre. Currently an Admin command. Added /TP string command which teleports self to a player. Example /TP _JB would teleport myself to JB. Currently a moderator command. Lots more feedback when entering commands for when they're accepted or denied. Time and weather now persistent through server restarts. Added /SetUser /SetMod /SetAdmin for changing player perms. Admins can set moderators, owners admins and so on. Added /UnMute and /UnBan commands. Added /ModHelp /AdminHelp and /OwnerHelp for commands help. Added user permissions. Moderators, Admins and Owners for servers. Added /Kick, /Ban and /Mute functions for server admins. Cleaned up connection process to master server. UI now kicks player back to connection page etc. Added steam authentication for game so that our built in system could be replaced. No longer required to make 3rd party accounts through us. Steering wheel animation added to vehicles (with hand movement). Players are now able to enter vehicles. Added headshot animation when shooting other players or zombies. Added headshot, body and limb damage when shooting other players or zombies. Added new clouds system for more detailed clouds. Extended sound manager, added sunrise and sunset sound events. Added several new crafting categories and sub categories. Crafting can now return more than one item. Large trash piles now lootable. Light switch states are now persistent so that the light can be in the "On" position even while unpowered. Light switches are now animated. Zombies now have footstep sounds when walking. Added interior lights with working switches and removable bulbs that can be replaced when broken/missing. Introduced full electricity circuit support for houses. Generator, meter and breakers all need to be present. Introduced free placeable proximity based generator usage for setting up mobile camps and traps. Added inter-actable breaker panels for building power circuits which require individual breakers which can blow. Added inter-actable electricity meters for building power circuits which require extension cords to connect generators. Added craftable work lamps which can be powered by nearby generators providing you have an extension cord. Added free placement system. ALL item pickups and all moveable machines can be moved around and placed using this system. Added free placeable machines support. Campfires, work lights, generators etc are all now placeable by the player. Added support for resource based fuels for machines like generators. Clearer GUI layout for displaying fuel available in fireplaces/generators. Support for max resources on items rather than the previous 100. This will allow for certain objects to hold more or less "resource", whatever that might be. Added support for multiple argument chat inputs for commands which will allow for a greater range of possible commands. Fall damage that doesn't throw false positives for falling has now been implemented. Hit sound effects added when damaging zombies. Hit effect/animation on zombies when damaging them. Zombies now scream at certain times / trigger events. Command - /KillZombies <Distance> added for server admins. Command - /SpawnZombie added for server admins. Night zombies left behind from night will become day zombies and will actively seek for building interiors. Day zombies now turn into night zombies and start roaming outdoors during the night. Accessibility to whole game world. 64sq km island, some smaller islands planned. In total 50+ sq km more playable area than in Stress test builds. Optimisations to loading and deloading of world items meaning lower RAM usage and improved performance. Overhaul of world loading and deloading for greater performance. Alteration to distance drawing methods allowing for near infinite viewing distance while increasing performance over stress test builds. Implementation of extra admin commands for server owners. Passive AI logic implemented (currently chickens only which will be expanded on in coming builds). Aggressive AI logic implemented with dynamic zombies which change behavior based on lights and sounds. Slower more "dumb" zeds, lurking in houses during the day and aggressive prowling zombies during the night. Vision system for AI which give them only basic vision in front of their eyes rather than a simple "trigger" radius solution. Player sound trigger radius for alerting AI based on the noise you're currently making which allows you to sneak up and around zombies and ai. Shooting will also multiply sound and increase the range in which AI can be alerted by your presence meaning that being tactfully quiet is essential. Dynamic route setup for ai so that they're not solely limited to preset routes meaning zombies will climb through windows and over fences. New sub ID system for item pickups which makes item management easier of a server admins. Our own LOD (Level Of Detail) logic which works better for our needs allowing for greater performance and tailored behavior. Custom LOD (Level Of Detail) logic for AI which allows skinned mesh renderers (AI visualization) to have different amounts of detail based on distance, meaning we can have more AI. Voice chat (VOIP) added. Currently proximity only but 80% of logic is done and will be in for next build for fully functioning ranged radios. More structures added and several variants of each. Bum forts added with inter-actable items (sleeping bags, containers). 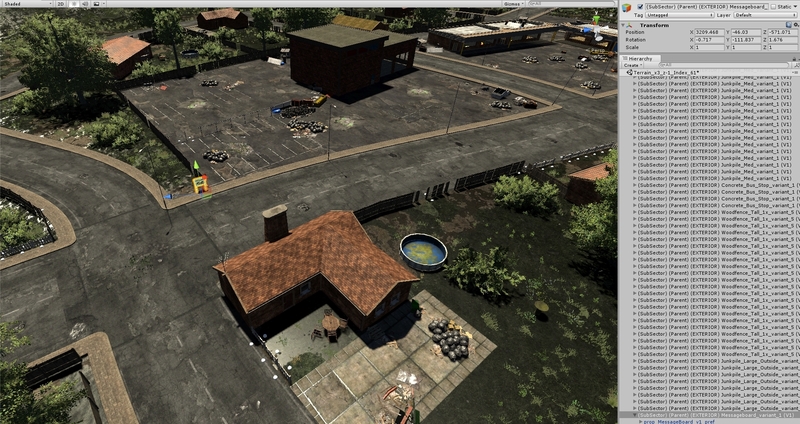 Several large structures added - Fire station, Police station, School and large Power station. Fixed some name spacing issues in the inv. Adding stats will now trim the amount to the highest possible amount rather than just not giving the stat boost. Adding health to stats now works. Adding stats to other players now works. Fixed issues with chat which would cause your currently typed message to highlight. Fixed long standing issue where the player was visible to other players before they were fully loaded. Fixed equip messages in the chat. Cleaned up game launch process and entry into menus. Disabled buttons in the main menu now appear grey. Now looks better for features that are in development or broken. Refresh list button in main menus now works. Cleaned up existing connection messages and reworded miss leading messages when connection to the server has been lost and the menu is reloading. Cursor no longer locks after command has been entered into the chat. Player login message is now at the correct time. Player is now visible after the client is done loading rather than on initial connection. Fixed garbage collection issue with snow shaders. Fixed issue where sky would be double after connecting to a new server. Fixes to messages when exiting server. Fixed issue with Steam authentication ticket not being returned after player session which was resulting in an inability to connect to the server again until restarted. Altered message system so that commands now show in the chat after their submitted. Fixed loophole which could potentially have let more players onto a server than was allowed. Altered the drop logic when removing items from your inventory so that they now snap to the floor rather than fall with physics. Can now cancel placement mode with escape which will drop the item in it's current location or return it to where it was if it's not possible to drop in current location. Altered placement system so that the items doesn't have to be snapped to the floor in order to place, meaning the item can be dropped to the floor as long as it's not colliding with something. Resolved issues with placement system allowing to place inside of certain objects and improved the system overall. Resolved some issues with locks highlights. Fixed issue where lock GUI wouldn't close with "Escape" key which would lock you in the menus. Fixes to entering and exiting menus which were causing the player to get locked. Fixed highlight issue with placeable locks where multiple locks would highlight. Improved machine logic for better parts persistence. Beds working correctly now for logging off at a safe position. Free placeable tents and sleeping bags also work. Proxy reload animation now start at the correct time rather than after the reload has happened. Alignment fixed on [Add] button for adding batteries to a flashlight. Improved grey/black inventory buttons for when things can and can't be interacted with. Improved some object ID related stuff which should improve persistence. Fix to stop zombies spawning close to players. Improved loading behavior to prevent the player being able to move around before the world is loaded in fully. Windows fortifications optimized via mesh combining which was slightly inefficient before. Further fixes to being shot up into the air on colliding with certain objects. Optimized network logic for other player visualizations meaning less network traffic. Optimized network logic for other AI visualizations meaning less network traffic for out of range AI while keep persistence between connections. Hardened persistence logic for item containers. Fixes to roads so that they clip less with the terrain in the distance. Improvements to roads to remove unrealistic hills and turns. Finish up logic for radios. Lots of lose ends to tie together. Able to put up planks on the inside of a window because of FortificationDivider. Other players weapons state isn't buffered and therefore means that you won't always see the item they have equipped. Issue where small GUI window doesn't show in the correct position. Some people are experiencing issues with the in game web browser. Please search for and submit bugs and try to be as specific as possible. Some changes have already been made which should help some people. Movement is high priority. Although it's been vastly improved from Stress Test V1.0.x we'll need to revisit this when character customization is implemented. Added death effect and smoother transition back to menu. Added fix which may stop the server player count going negative. Further testing required. Crashing/Disconnecting/Dying should now make the cursor visible again. Further testing required. Can no longer consume items when you don't have the correct items in hand. Changed FireSounds to be assigned to the correct group. Now you can't hear guns being fired when Effects Slider is down. Changed the Coordination System so that it would be easier for devs to teleport. Fixed effects on the Board (Sound / Particles) not spawning. Footsteps is assigned to the correct Sound Group, should now play again. Double door in brick house in town removed. Double door in plaster house removed. Shadows on arms and weapons added when player is in sewers. Fixed an issue with health being able to get into negative figures. Richards rice will no longer destroy inventory UI. Ping should now be displaying more accurately. Physical pickups don't always act as expect and sometimes can't be interacted with. This is a known issue which we're working through. Tree and other items have had this issue in the past but are now fixed. Weapon no longer hides when opening the chat. This is the intended functionality as weapon hiding constantly was super annoying. Movement is high priority. Although it's been vastly improved from Stress Test V1.0.x we'll need to revisit this when character customisation is implemented. Name tags now have slight colour tint based on mental state. Colour ranges from red to white for bad mental state to neutral and white through to green for positivite state. Some extra clarity to crafting items and how they're displayed. Flashlights get dimmer as battery runs low. Self now casts shadows (Still in process of making accurate to what the player see in first person). Quit and lobby connect attempt window for when there is no lobby connection. This allows the player to quit the game if their client cannot connect to the lobby server. Craftables now show the qty produced. Flashlight no longer goes off at 26% battery remaining. Ladder on hunting hut now working. Doubled-up doors fixed in plaster buildings. Missing door handles added back. Mute button not working fixed. Axe substance not building is now building on start. Flashlight no longer breaking the first person shadows. Missing material added to intersections. Colliders fixed on: Public Bathroom. Colliders fixed on: Wooden table and chairs. Colliders fixed on: Monkey bars. Colliders fixed on: Playground slide. Nametag turns off after 30 meters. Gaps removed from low quality tree models. Sounds no longer start playing when walking into sectors. Fixed issue with custom culling terrain zones being able to be spam turned on and off by walking in and out of the respective zones. Testing characters clothing changed to more subtle colours instead of everyone wearing red jackets! Changed container item spawning so that items spawn more random and wont continue spawning new items if some items have already been spawned in that position. Can no longer spam doors opened and closed instantly which would cause a bad visual effect. Updated some notification messages that go into the chat when playing the game. Mainly for clarity. Removed lag between a2z splash screen and menu scene. Pressing B in the menus no longer takes a screen shot. STN logo in bottom left corner of menu scene randomises time, season and weather. Base logic for crafting implemented and functioning at a basic level. Again needs fleshing out during next round of testing. Base logic for window fortification which will be fleshed out during these tests and then extended to be used on things like door frames and added functionality for sheet material. Added a2z(Interactive); splash screen on start which hides the intial load of the menu scenes. Clothes changed on temporary player characters to something more subtle. All proxy movement and animations have been improved however still preliminary for the time being. Loading screens now have changing tips which assist the player when getting started with the game. Damage taken effect now have sounds. Added multiple damage effects so that damage from hunger/thirst and being shot are different from eachother. Added log off cooldown to help prevent combat logging. Added log off points which retain the players exact position between playing sessions (beds, sleeping bags etc). Logging off without using a safe log off position will cause the player to log in at a near spawn point to where they logged out. Added stat read out in the player inventory for consumables. Log spawn position has been improved when cutting sections off trees. Last piece of tree/tip is now a pickup when the last chop is made on the tree. Trees no longer fall through buildings when leaving the area and returning later or when the server restarts. New quality settings added, these settings should help with performance on older machines/macs. LODs and culling improved on ALL objects..ALL of em! Empty ammo boxes now get removed from the inventory and destroyed istead of sitting with 0 ammo in them. Ammo boxes can now have different max ammo capacity instead of defaulting to 100. Added support for weapon weights to alter dependant on the amount of ammo in the clip. Added support for items that are "boxed" like ammo/screws to have floating weight dependant on how much is left in the box. Added colored text support to small hover UI to indicated if you have the required items in your invenotory. Added list support for small hover UI so it can display a list of required items to place item. Now possible to double click server objects in the server browser menu to begin connection! Menu is now dynamic landscape with changing time of day and seasons. First person models are now on the same camera as the rest, this means they receive shadows and have image effects on them. ​Added system message to indicate that the weapon you're trying to reload is full. Username now saves between sessions and keyboard focus goes to the password input field if username is filled in. Pressing enter now activates the next button in the main menus. Can be used for login in or registering. Tabbing between main menu items now works. E key now works for interaction in a works as well as Tab. Added click sound to inventory GUI. Containers now shows description for the selected item or the container and capacity if no item is selected. Added press effects to some buttons in the main menus. System message is now entered into the chat when trying to pickup an item while there isn't enough space in the inventory. Safe log off positions added. Leaving a server via a bed or other (to be confirmed) objects will save your position for when you next join. Added cool down timer for all methods of leaving the server. A more sophisticated combat log system will be added at a later date. Sound now plays to indicated that a locked container or door is trying to be opened. Placement system for locks added. Locks can be fit to interactive objects at set points within the world and highlight green to indicate you can place the item. Green highlight only shows when trying to place that specific item. Interactive objects like fireplaces now show descriptions. Tree stumps now have a function and become the primary way of chopping wood from log to firewood and firewood to kindling. Improved interactive object initialization which helps loading times on start. Added functionality for cocked and un-cocked weapons status which means the weapon will take longer to reload/arm if not already in the cocked position. Corresponding animations also implemented. Added logic for take out and put away sounds. Added logic for weapon reload sounds. Weapons can now be cleaned using cleaning kits which makes the gun less likely to jam when firing. Finally added the ability to change mouse sensitivity. Added ability to inspect weapons using a certain keyboard input. Gun wear is now visual on the weapons texture. Weapons now have wear factor which directly effects the guns function. Bad condition weapons have a higher chance of miss firing and jamming. Weapons and items can now have multiple idle animations. Garage doors can now be opened and closed. Loot style diversified from just single categories. It's now possible to have multiple category types spawning at different spawners. Containers can now spawn loot. All containers are now lootable, few examples being - bed side tables, draws, fridges, kitchen cupboard. Grass updated in stress test area. Better ambient light in morning/evening. Lighting, image effects and shaders updated. Parallax occlusion mapping added to terrain on ultra settings. Containers can now be loaded into the culling system allowing for greater amounts of interactive objects. Doors can now be loaded into the culling system allowing for more interactive objects. Consuming health changing things like painkillers or using bandages now effect immediate health. Drinking fluid is now possible and effect stats as expected. Eating food now possible and effects stats as expected. Added /Wave and /FlipTheBird gestures that players can initiate via the chat. Short commands also works, for example - /Wave /wave /W /w all work for waving as well as /FTB /ftb /Finger /finger. Added /Gestures command which returns a list of useful player enterable gestures. Overall health stat now implemented and persistent. Sickness stat now implemented and persistent through restarts. Calories and daily required calories stats now implemented and persistent through restarts. Stamina stat now implemented and persistent through restarts. Hydration stat now implemented and persistent through restarts. Health stat now implemented and persistent through restarts. Added the ability to select each stat so that a description can be shown for how each one works. Added DB for persistent stats. Color space switched over to linear space with a custom deferred shader to improve looks. Weapons no longer havea chance of spawning with more ammo then they can actually hold. Fixes to invenotory weight calculations and GUI representation. Fixed some small item Hover GUI scenarios where the wrong information is shown. Fixed some placement issues with small information hover GUI. Fixed allignment issues on quality setting menus. Changed the way browser pages get pixel position on screen for better fitment. Changed main menu UI scaling so that it works better with multiple resolutions. Fixed issue with loading menu getting stuck as it progresses to 100%. Fixed hit detection for tree felling so that sounds and particles play correctly every time. Aiming no longer cancels reloading animation. Opening the inventory while reloading now cancels reload animation. Can no longer sprint while cleaning a weapon. Fixed issue with weapons that would cause the server and clients ammo to go out of sync. System messages displayed when you cannot reload your weapon. No ammo or too close to a wall as example. Clearing Jam animation now cancels aiming down sights. Pressing reload while the weapon is jammed will no longer override jam clearing animation. Spamming fire no longer possible while the weapon is jammed. Removed quit timer when quitting game from outside of a server. Progressively loaded weapons can no longer be spam reloaded. Progressively reloaded weapons now have reload sounds. Aiming down sights now cancels idle/inspect animations. Sprinting now cancels inspect/idle animations. Can no longer start inspecting weapon while sprinting. Visual improvements to the inventory GUI buttons for clarity. Removed delay on opening closing inventory and containers. Fixed issue with buttons in UI staying highlighted after press. Cursor now locks after connecting to a server after disconnecting via the ingame menus. List of servers is no longer gone after going back to the server list after leaving game. Being able to shoot/attack while in the menus or inventory is now fixed. Inventory starting items only get given if it actually your first time connecting to that server instead of just if your inventory is empty when you log off. Cursor now locks correctly after closing lock GUI. Can no longer interact with with objects using tab while in the menus. #465 Can open campfire through roof issue fixed. #460 Fixed floating bushes with the vegetation update. #464 #456 Fixed with the character updates. Fixed parking lot flickering by changing shader offset. Can no longer open the chat while in the inventory. Can no longer open machines or containers while in the menus. Optimised the way weapon sounds play. Fixed some missleading GUI on small hover UI. Can no longer inspect weapon while reloading. Can no longer aim down sights while weapon is jammed. #445 #534 Fixed gaps in terrains by stitching terrains together. #382 #455 #403 #348 #296 #281 Jump through object glitches no longer possible. Tree LOD stages now more optimized. #437 Disappearing textures fixed by fixing the culling sectors. #2 #459 Fixed flickering on a few decals (wrong shader). #515 Fixed objects not loading in by moving the culling zone. GUI scaling issue on quality presets now work as expected. Fixed audio bug when quiting the game. Black sky when reconnecting to the same sever or occasinally when joining a new server no longer happens. Unlimited sprint glitch no longer possible. When in menu or bug tracker - player still occasional does actions ingame now fixed. Possibly still scenarios where this can happen. #499 Inventory is now scrollable when the page of items is full. #556 No longer possible to interact with interactive objects through walls. #524 Crosshair no longer stays green after interacting with objects. #579 not being able to uncrouch in some instances now fixed. #278 Collision added to open doors. Wrong GUI colours in the main menus now fixed. Changes to the door logic so that the animation only plays if actually required. Changes to door logic so that they can be loaded into the culling system. Opening the inventory now hides the chat. Conflict issues between the chat and inv now resolved. Fixed issue with inventory where it would flick off and then back on again when dropping or moving items. Changed Status - not working UI to properly represent the state of the items being interacted with. Stamina now returns while in the inventory. Footsteps on multiple surfaces now working. Descriptions now resize with the rest of the inventory correctly. Stats now resize with the rest of the inventory correctly. Selecting the Inv. button in the top left of the inventory now resets the displayed description to the main inventory description. Fixed [Add battery] UI positioning in inventory when adding a battery to the flashlight. Changed [Add] button to [Add battery] to make it a little clearer what the button does. Items now correctly display health in the inventory. #406 Glitchy backward sprint now fixed. Can no longer jump and ride up steep objects. Jump is now cancelled and the player slips back to the ground over a certain steepness. Limited vertical velocity to a realistic amount. Can now stand up from crouched in all spaces with enough headroom. Can no longer initiate sprint from crouching if headroom is obstructed. Can no longer jump if head headroom doesn't allow it. Changed the crouch height slightly to make it feel more realistic. Collision changed on garage (fixes pickups spawning in the floor). Collision changed on a few rocks. Ability to load doors in to the culling system which means better optimisation and greater amounts of interactive objects. Added console message when trying to interact with a machine that doesn't have enough parts. Fires now take a larger stack of 10 wood to save players having to tend the fire constantly. Chopping firewood into kindling now yields 3 pieces of kindling. Fires now consume kindling on starting the fire. Kindling now weighs 2lb each. Tree fall damage order now changed so that transition doesn't hapen on hitting player. Makes for more satisfying squishing. Collision fixed on the garage (might fix #404). #544 Collision fixed on rocks. Removed most of the clipping roads and decals by using a custom shader. Added distance culling to more pickups. #545 Collision fixed on bins. #541 Fixed broken lake edge by extending the mesh. #424 Removed the floating object. #430 No longer falling through bridge uppon spawning. #423 Stopped the ability to look in chests even when behind an obstruction. #485 All logs can now be chopped into firewood. Oak and young pine variants previously didn't work and displayed "use" instead of "chop" in the inventory. #519 Crosshair now hides when in chat or menus. Container quantity column in the GUI no longer clips. Added system message to chat for when trying to drop an object in a place where it's not possible. Hit effects when being shot by another player. Particle effects play at point of collision with the tree better when chopping. Tweaked the dud hit sounds on trees. Improved hit detection points for trees so that they now play the correct sound. Green crosshair now goes off after picking items up. Flashlights no longer cut trees down at the same rate as axes! Still possible to cut a tree down with a flashlight but is now 30x harder than with an axe. Weapon no longer hides when opening the chat. Issue when using symbols in user/pass. Using certain symbols will break your account and you will have to contact support to get it flushed. Known login issues is a high priority. Distance culling added to pickups to improve performance. Tree's now persistent through relogs. Starting items now working. Currently set to 1 flashlight and 1 battery. Trees now transition when hitting any hard surface rather just terrain now that tree mechanics have been improved. Fixed issue in changelog which was confusing people as to what the current version was. Potential crash fixed when taking items from manchines (Currently only fires). Server crash caused by taking all items from a chest when a part stack is already in the inventory. Crouching and jumping can glitch the player through objects and launch him into the air. Melee weapons don't do any damage currently. Fixed issue where objects fall through things if you leave and come back. Item pickups now display green crosshair to show interaction is possible. Main tree trunk chop positions improved and made easier to hit with the axe/hatchet. Tree transition to choppable stem now smoother and nicer to look at. Tree chopping significantly improved to help prevent glitching movement when hitting other objects in the world. Improved green highlight mechanic so that it's more consistent. Changed firewood chop into kindling from giving 10 kindling for 1 firewood. Chopping 1 firewood now yields 1 bundle of kindling. Altered the crosshair to make it more noticeable and easier to look at. Removed hover UI on chat which shouldn't have been happening. Implemented melee damage (arms still won't do damage). Tightened up axe and hatchet chopping on trees. All player spawnpoints rotated in a random direction. Improved collision detection for falling trees. they shouldn't glitch into things so easily anymore. Broken collision fixed on seesaw. #420 Spawning inside of rock fixed by moving spawnpoint up. #410 Collision fixed on monkey bars. #405 Fixed collision on sofas. A lot more player spawn points added. Compatibility with the web pages improved and are now actually working on mac. #298 Hovering pickups above table fixed by changing collision. #301 Fixed by adding collision to the slabs. Players now drop backpack content on death. #294 Floating vegetation moved down. #35 Walking up powerlines fixed by decreasing slope limit on the controller. #337 Fixed collision problem with the grocery store, this still needs checking. Fixed a few unlinked materials on one of the tree stages. #329 Fixed floating power line pole by editing terrain. #398 Broken campfire light fixed. Improved ragdoll and added blood effect when the ragdoll gets shot. #357 Collision fixed on clothing lines and wind mill. #310 #386 Floating crashed plane moved down. #368 Falling through world glitch fixed by adding back missing prop. #388 Floating props in garage fixed. Broken LOD on one of the houses fixed. Removed some more shadow flickering. Light range from fire place wood-burning stove increased. Wind turbine and wind mill now rotate. #338 #380 Collision through upper story wall problem fixed by adding back missing mesh in collider. #391 Gas station doors popping in fixed by moving them in the right sectors. #378 Falling through world near sewer entrance fixed. #290 Missing muzzleflash added to Lola and Gary gold, the animations are fixed in the current version. Ambient light increased in the morning/evening. Improved gas station culling zone. Cabin door sounds changed to 3d, checking other doors now. Culling zone fixed on grocery store. Increased sprint duration and sped up recovery times since it's only temporary for testing. Randomised loot locations and doubled amount of spawn locations. Fixed pink material on tree stumps. Tree cutting made more difficult overall. Diffent tree cutting tools now do different damage to trees. Issue with in-hand items not showing on low and medium quality settings now fixed. Tree hit points for chopping now playing the right sound. Removed jitter when turning left/right and looking in the other direction. Young tree pickup hover UI now in center of the object. Accidental hard limit on the max amount of inventory items removed. #276 Park bench seat collision fixed. #275 Door not opening fixed. #279 Floating scenery under bridge fixed. Fixed positions of one door variant that had become broken within the world. Fixed some keyboard input issues for Windows. Login/death system messages added to the chat. Altered colours to easily tell the difference between console and users messages. Fixed alignment on textfield for main chat field. Text not longer runs off screen when breaking line. Upped spawn rate of items. Still temporary and will need tweaking once we've done some testing. Fixed missing category tab icons in the inventory. Enabled several terrains beyond the containment wall since they look nice when you're able to see over the wall. Tweaked the tree felling damage so that it "hits" the player better. Made the "shoot up a mile into the air" glitch much harder to do after being reminded by - way420. Fixed a bunch of missing door sounds. Missing materials on gun shells added back. Few problems with culling sectors fixed. Floating rock near bridge moved. Fixed collision on new rock prefab. Floating bush near farm moved. Problem with the far clipping plane of the camera resolved. Broken meshes fixed on some houses. Muzzleflash now follows the end of the gun. Wrong hit decal rotation fixed. Avoidance removed from melee weapons. Fixed model problem with graveyard oak tree. Issue fixed with lobby where it was possible to sign in with blank user/pass. All 8 tree variants can now be cut down. Oak trees no longer have disapearing stumps when starting the chop process. Largest pine tree felling now fixed. Chat now auto scrolls in large panel. White dot in temporary menu backround removed. Chat position updated to make it as hidden as possible. Tweaked Chat text colours to make them easier to see. Fixed alignment issues with chat. Sprint > aiming where arms position glitches is now fixed. Main inventory item section is now scrollable making the item limit only be tied down by carrying weight only. Random block on picking up items now fixed. slight headbob added to increase immersion. Added a bunch of console messages for things like picked up items, inventory weight etc. Tree fall damage implemented. The tree always wins. System messages now setup for things like picking up objects etc. (Yet to actually add most system messages but they will be slowly introduced). Ammo boxes now have individual textures which makes identification easier. Fixed Version number in top right corner of screen. Esc closes the inventory now instead of closing the inventory and opening the menus in the same click. Chat now closes when opening the menus. Esc key now closes chat in addition to Return when sending a message. Cursor locking working better for chat. Recoil and gun behaviour characteristics updated. Sway added when aiming down sights. #41 Water collsion lowered so it feels more like swimming (temp fix). Proxy weapon sounds now work and are 3d with rolloff. Will need tweaking to find levels across the board. Login area now works better with lower resolutions. Password entry for login and registration is now hidden. Audio sliders now adjust the volume over the full range rather than just 30%. #182 Web UI now resizes correctly after leaving web pages and then returning. #180 Pressing escape right after being killed is now fixed, issue was causing a crash. #178 cursor now locking again after reconnect. #44 Temp fix for blocky shadows from wood stove added. Removed issue with databases not keeping the inventory in sync after reconnect. Fixed issue where it was possible to drop an item but still retain it if equipped when dropped. Altered key binding section of the options menu to properly display that the feature isn't implemented yet. Altered the web reload animation so that it only plays if the press is registered. Added back button to web UI stuff for easier menu browsing. Added firelast shot, and last shot reload to Garry&Lola handgun. Small change to dynamic audio player so that tracks are chosen better. Some typos in the main menus have now been fixed. Probably lots more. Fixed crash issue when changing resolution after being in web tabs. Lowered music volume at start so that it doesn't blast your speakers. Mute button now remembers the volume before you muted so that it it is put back as it was. Audio sliders in menus are now persistent through restarts. vSync menu dropdown now persistent through restarts. Blood hit effect on other players when shot. Hole collision issue should be resolved for gaining access to tunnels and sewers. Master mute button in bottom right corner of menus is now linked to global sounds. Audio sliders in main menu now linked and working. Item spawn rate diversified and no longer instant after picking up an item. 3d sounds on doors, fires, weapons. Some sounds may still be 2d, please submit a bug. GUI resolution scaling issues resolved. Video settings GUI dropdowns now position correctly. One login attempt issue before being disconnected from the master server. Login attempts can be repeated until logged in. Other players flashlights animations now working. Animations on other players for FRKS and WoodAxe now working. Pink axe on other players now displaying the correct texture. Flashlight sounds now now working. Solid panels doors are fixed temporarily. Chopping log from higher than the first chop point is no longer possible. Flashlight on buffer for when the inventory is closed is now working correctly. If the flashlight was on when you opened the inventory then it will be on when close (No battery is used while in the inventory). Additional fixed to Video setting UI when scaling the screen resolution. Collider jump glitch on rocks mostly fixed. Tree chop point height changed on all trees. Floating doors and shaking cabins fixed. LOD transition fixed on Bushes. Level of detail added to “shed”. Light bleeding through window edges fixed. Forward fog in water fixed. Gap at bridge sides fixed. Moved barrels up near bridge. PM extrude height fixed on terrains. Floating ground cover near town entrance fixed. Floating vegetation near farm fixed. Missing chain link fence pole added. Collision fixed on “basketball field”. Collision fixed on “tennis field”. Collision fixed on “rain barrel”. Collision fixed on “crashed plane”. Collision fixed on “feeding trough”. Collision fixed on “chain link fence pole”. Collision fixed on “Flower bed”. Collision fixed on “Large bridge”. Collision fixed on “Big generator”. Collision fixed on “Wooden Guardrail”. Collision fixed on “Bird bath”. Collision fixed on “Wooden table”. Collision fixed on “hay bales”. Animated back button on login screens. Chat implemented but very basic and meant only for people to chat globaly during the stress tests. Redesigned GUI will come in the near future in addition to Area and global options. Login menu only displays when you’re able to connect. Failed login will still require relaunch currently. Doors no longer open by default on start now. Somewhat dynamic audio manager added. Menu music will play when in the menus but only if the last track has elapsed and vice versa. Glitchy lean functionality has be temporarily removed. Issue that stops you pickup up objects from the world.